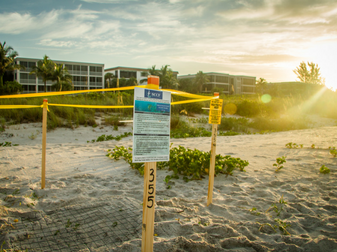 During the spring and summer you will notice areas of beach on Sanibel and Captiva roped off to protect our nesting shorebirds and sea turtles. February 15th marks the official start of Snowy Plover nesting season in the state of Florida, with Wilson’s Plovers and Least Terns following a little later; typically nesting in late April or early May. Sea turtles begin nesting in April as well. All three of our nesting shorebird spe-cies lay their eggs in shallow depressions in the sand. These nests are very hard to see and could easily be stepped on or run over, so they must be protected to prevent accidental destruction. Sea turtles bury their eggs in the sand, and their nests must also be roped off to avoid damage from heavy foot traffic. The enclosures for sea turtle nests are much smaller than those for shorebirds, and for good reason. After a turtle lays her eggs, she returns to the sea. Only the immediate nest area must be protected, and a screen is secured on the surface of the sand to discourage digging predators. Shorebirds must stay with their nests until the chicks hatch, and they will still need a protected area to raise their chicks after hatching. A shorebird enclosure is much larger as there needs to be a protective buffer around the nest. If people and dogs are too close, the adults will be flushed off the nest and that is a very dangerous thing. Eggs and chicks left exposed to the elements are subject to overheating, hypothermia in the rain, and getting buried in sand in high wind conditions. These can all happen very quickly. As a beachgoer, there are several things you can do to help protect our nesting birds. When you see an enclosure on the beach, the first and most obvious thing you can do is stay outside the posted area. Our beach nesting birds are incredibly well camouflaged. It may not look like there is anything in that enclosure but there is. If you see something inside the enclosure, such as a piece of trash or a Frisbee, please do not attempt to retrieve it. You can report these types of things to SCCF using the phone number listed on the signs (239-472-2329). If you see a person or a dog entering an enclosure, you can call the number on the signs to report these violations as well (Either SCCF or 888-404-FWCC for Florida Fish and Wildlife Conservation Commission). Sanibel Island beaches do allow dogs but they must be leashed at all times, and absolutely are not allowed to enter shorebird or sea turtle enclosures. In addition to respecting enclosure boundaries, beachgoers can help our beach nesting species by picking up trash and not leaving food on the beach. Trash and food are big attractants for some major nest predators including crows, gulls, raccoons, and even coyotes. Trash can also kill wildlife - especially plastic bags, plastic straws, 6-pack holders, and bottle caps. Animals often mistake these items for food and can die eating them, or become entangled in them. Crows and gulls are the top predator or snowy plover eggs and chicks, and it is essential that we keep them away from nesting areas. Raccoons and coyotes are predators of both shorebird and sea turtle nests. It is also very important to fill in any holes on the beach. Small children love digging! Unfortunately these holes can be death traps to flightless chicks and sea turtle hatchlings. If they fall in they cannot get themselves back out! Please protect our precious baby birds and turtles by filling in these holes and preventing a tragedy. There are many more things you can do to protect our beach nesting wildlife. If you are interested in learning more contact our shorebird biologist at shorebirds@sccf.org.